Our apologies for breaking from the jubilant celebration of the Zimmerman verdict, but we’ve had an international incident involving major misconduct within a government agency and the obligatory quota-fill dingbat anchorette who cluelessly read the telepromter while thinking about her nails. Yes, another people group has been offended. 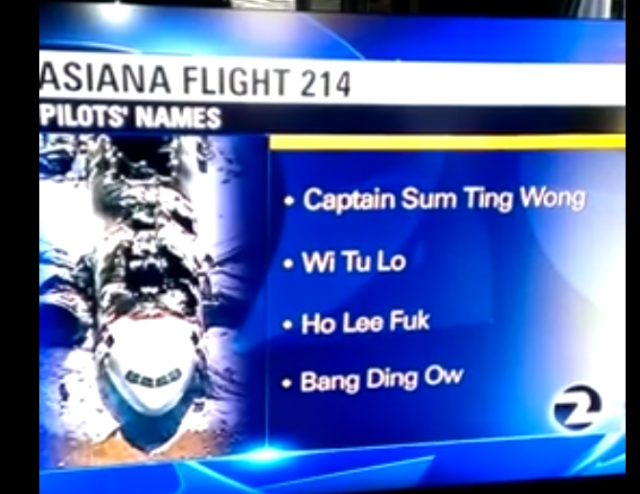 KTVU Channel 2, a Fox affiliate in the San Francisco Bay Area, and the National Transportation Safety Board apologized on Friday for an on-air blunder by an anchorwoman that involved fake names that ridiculed the Asiana flight 214 pilots. An NTSB intern had confirmed the names for the station. Co-anchor Tori Campbell told viewers during the noon newscast Friday, “KTVU has just learned the names of the four pilots who were on board” the flight that crashed at San Francisco International Airport a week ago. She proceeded to read from a teleprompter the names that may have originated as a racially insensitive joke online — “Sum Ting Wong,” “Wi Tu Lo,” “Ho Lee Fuk,” and “Bang Ding Ow“— while a TV graphic displayed the names next to a photo of the charred cabin. Oh man! Here it comes: The 10-week sensitivity training course and reassignment to our sister station in Wasilla, Alaska covering Sarah Palin salmon run expeditions! KTVU Takes Full Responsibility… Then blames it on the unidentified NTSB summer intern. But it turned out the NTSB also had a role. In seeking to verify the names, an unidentified KTVU reporter called the government safety agency’s public affairs office for confirmation, though did not read the names out loud, KTVU said. The station didn’t clarify how the names were conveyed to the NTSB representative, who turned out to be a summer intern. The report goes on to say that KTVU did not get the confirming intern’s identity and the NTSB has not said whether he/she will be fired. Dude, Yu So Fuk when NTSB hotty find you! Postscript: They’re taking the Zimmerman verdict well in Oakland, don’t you think? And, of course, they missed the navagator, Won Hung Lo, who ruptured himself trying to help the old lady escape from the plane. This entry was posted on July 14, 2013 by Regular Right Guy in Sarah Palin, The Race Card and tagged asiana fake pilots names, deborah hersman, ho lee fuk, KTVU, NTSB, PC Humor—Not!.